Audio CD digitally mastered: 18 tracks; 40.5 minutes running time.Each track is a poem performed by the author to a soundscape by Ron Sunsinger. Accompanying 24-page chapbook of poems as written (4.75 x 7.25 inches). In DVD case (5.25 x 7.5 x .5 inches). Released August 2009. Poems cover a wide range of emotion and include themes of the poet as he relates to others as a child, as well as his life as an adult. While none of the tracks contains explicit text, some poems make references to childhood violence and to alcoholism and are therefore not recommended for young children. Original art by Mark Woody, inspired by his reading of Jeff Hartzer’s poetry, compliments both the case and the chapbook.Published and distributed by Aquila Arts LLC. 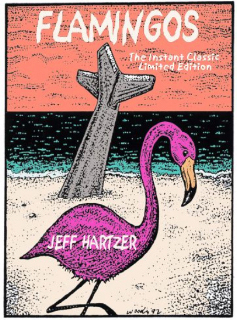 Jeff Hartzer grew up in the flamingo-laden land of Florida. He took flight to Tennessee and Washington State before settling in the open land of New Mexico, where he lives with his wife, Debra Landau, and their animal children. Retired from teaching, he now spends his time as the Executive Director of the AirDance ArtSpace and writing. Flamingos is, by turns, humorous, poignant, honest, sensual, disturbing, lyrical, and sentimental. Each poem stands on its own; taken as a whole, the collection describes a journey through a childhood that is wonderful and full, even as it is sometimes difficult and solitary, to an adulthood of mature perspective that includes self-reliance and gratitude for all that life has offered. Ron Sunsinger’s soundscapes complement Hartzer’s words and voice well. In most cases Sunsinger’s work underscores the emotional themes of the poems. For some poems the soundscape adds greater dimension, such as the ironic twist revealed in the recorded version of “I Don’t Know”. Unfortunately, there are a handful of times when Sunsinger’s backdrop overwhelms Hartzer’s delicate delivery. The chapbook provides a handy reference in those times and for further study of individual poems. Congratulations on the publication of Flamingos! I hope that it gets a wide circulation because it is so good. Standing alone, the poems in the book are deep and moving.....to me, really fine poetry. 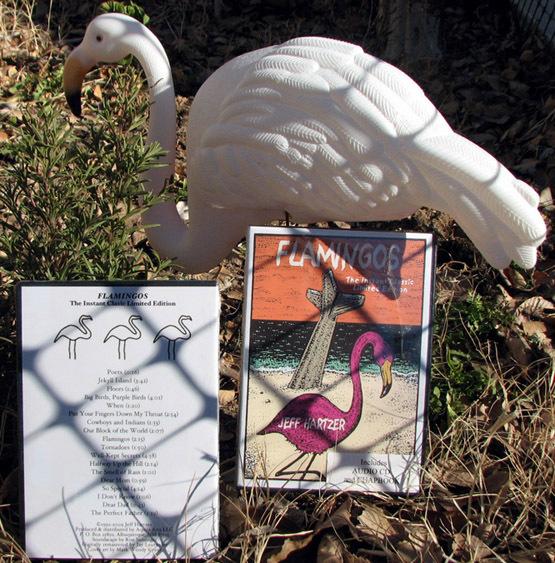 Then add the aural experience of poet reading-performing his own work, and Flamingos is truly a multimedia experience that expands the impact of each poem in the mind of the reader-listener. Thank you so much for [Flamingos]. The three of us listened to it together and it moved us in three different ways. It gave us some nice memories and some funny memories. I had never heard poetry like this before; it was very enjoyable. ORDER BY MAIL for only $10.00 !! Overseas orders: add $2 per item. For Canadian and other international orders and for anyone who doesn’t want to use PayPal, please see the information at the bottom of this page or contact Aquila Arts by e-mail. 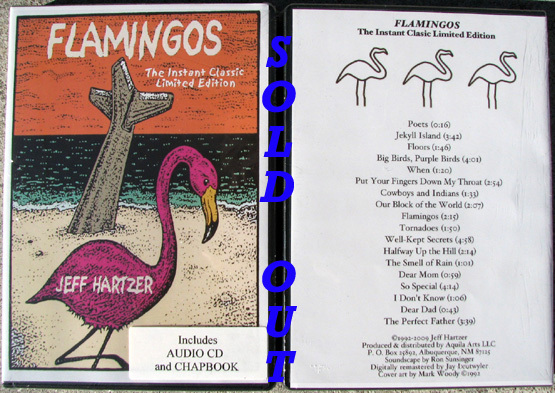 If you want Flamingos signed by the author, please send him an e-mail when you place your order.